Fruitless Pursuits: My Paper Heroes: Papercraft Avengers! 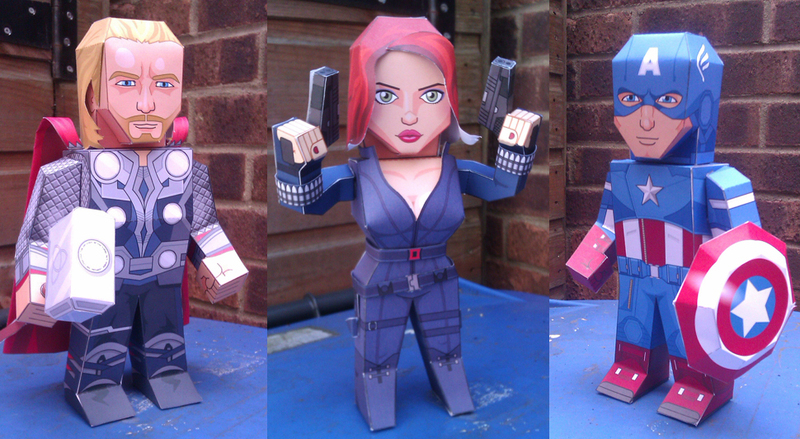 My Paper Heroes: Papercraft Avengers! You don't need to spend huge amounts of cash on expensive Avengers tie-ins to satiate your buzz. Not when nature's greatest resource - trees - are completely free and abundant, so why not use your ingenuity to down a mighty oak, turn it into reams of paper, and make yourself some brilliant Papercraft Avengers! I want to make some of these so bad that I might actually change the cartridges on my creepily dusty printer. (I actually even have spare cartridges. I'm just really lazy). If you want to assemble your own team then go to My Paper Heroes to grab: Nick Fury, Hawkeye, Thor, Black Widow, Captain America and an appropriately incredible Hulk. If you make them then you should send us a picture or something. Now go murder that stupid tree! Lucky Dice Is A Super Fast / Super Addicting App! Review: The Deep: Here Be Dragons! Pre-Order Square Enix Play Arts Kai MASS EFFECT!? Review: The Art of The Avengers! Tuesday Bounty: Glorious Bounty Opens Up! Adventure Time Retro Video Game T-Shirt!